Submitted by lmcshane on Sun, 06/24/2018 - 10:59. Would be interested in your dissection of current Ken Johnson investigation. however, I believe that another councilperson - Tony Brancatelli does warrant an investigation for contracts secured by his wife's company/employer Hatha Communications. Can you verify whether Cleveland.com has opened an investigation into any current Cleveland city council person?? 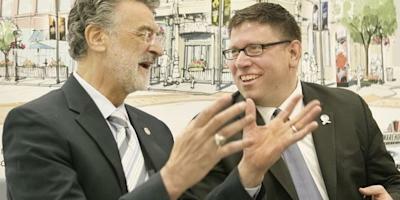 Cleveland.com began its investigation in the wake of accusations from Cimperman's election opponent at the time, Carrie Kurutz, who claimed the incumbent had voted numerous times to approve contracts with LAND Studio and with its predecessor, ParkWorks, despite the fact that his wife, had worked for one or the other since 1996. According to court documents, Cimperman penned two resolutions in 2008 and 2009 that championed ParkWorks' applications for about $2 million in grants through the Clean Ohio Fund. The company sought the grants to acquire two parcels and a portion of a former railway to build a trail and green corridor connecting the Towpath Trail to the Lake Erie shoreline at Whiskey Island. State law prohibits public officials from using their authority or influence to secure public contracts in which the official, a family member or business associate has an interest. Doing so could amount to a fourth-degree felony, punishable by a fine of up to $5,000 or as many as 18 months in prison. Scene magazine's coverage relative to the cover story on Ken Johnson. Submitted by lmcshane on Tue, 01/15/2019 - 09:31. Yost's office on Wednesday charged Cimperman with 26 counts of having an unlawful interest in a public contract, with offenses dating back to 2002. The investigation focused on public contracts and grants that Cimperman voted to approve during his tenure on council that benefited ParkWorks, where Cimperman once served on the board of trustees and where his wife, Nora Romanoff, worked as a senior project manager. ParkWorks later became LAND Studio. Submitted by lmcshane on Fri, 01/18/2019 - 08:20. I am requesting the monthly expense reimbursement reports for Councilman Anthony Brancatelli - from the date he assumed the position. Ms. McShane: You have not asked for specific documents. To see if contracts have been awarded to Hatha Communications, please go to www.clevelandcitycouncil.org go to the Legislation page under the Legislation and Laws tab. You will be able to search by name to find authorizing legislation. To review votes of members of Council, please go to The City Record under the same Legislation and Laws tab on the Council website. The City Record shows the votes on specific pieces of legislation. Thank you for the information about legislation. I was not able to see any votes on Hatha, but the Hatha website lists several Cleveland departments and CDCs as clients-also Cuyahoga County Land Bank and affiliated CHN. Anthony Brancatelli chairs the board of the Cuyahoga County Land Bank - in addition to his role as Ward 12 council. Here are the clients that pose a possible conflict of interest. I would like to at least review the monetary amounts of the contracts that deal specifically with Cleveland City Council and Slavic Village Development Corporation. These contracts must be on record at Cleveland City Hall. So, I am amending my original request for these documents. Why are you running propaganda on a councilman who should be exposed for his destruction of heritage in what was "Slavic Village?" His ties with demolition contactors, collusion with Cuyahoga Land bank on YMCA tax wite out of $118K in back taxes on 3881 W. 25 for CHN-Eden fraud and contract steering of huge developer fee through Detroit Shoreway CDC, and his wife's company Hatha Communications getting lucrative contracts with Cleveland Water and other city departments should prompt an investigation, not this whitewash. **** CDCs awarded funding through Councilman Brancatelli in form of federal CDBG and local NDA Neighborhood Development Allocations.